AKTU Final Examination Center List for Odd Semester Examination. 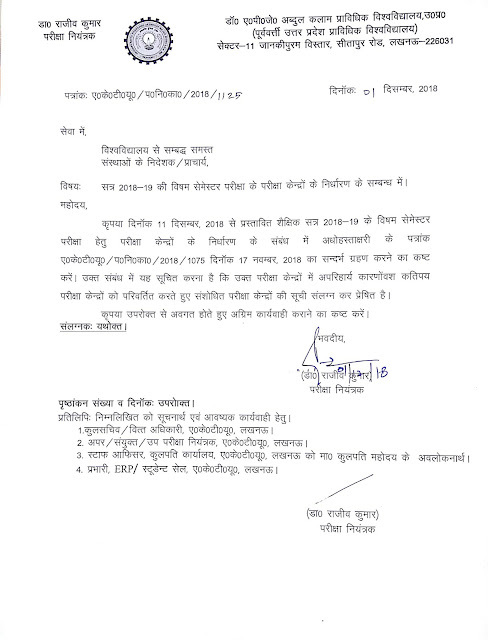 Download AKTU (UPTU) Final Examination Center List for Odd Semester Examination at aktu.ac.in. The Final Examination Center List for Odd Semester Examination 2018-19 has been released by Dr. APJ Abdul Kalam Technical University. The theory and practical examinations for various courses like B.Tech, B.pharma, MBA, MCA, BHMCT, BFAD, B.Arch, M.Tech, M.Pharma and MAM courses for the academic year 2018-19 are scheduled to be held from 11th December 2018 to 7th January 2019. This is the final list regarding the Examination Centers for the Odd Semester Examination 2018-19. The Aktu has already confirmed that it will conduct its regular/Carry-Over ODD Semester (1st 3rd 5th 7th sem) Exams from 11th December 2018. The AKTU Admit Cards for odd sem exam is likely to be released 10 days prior to the exam. 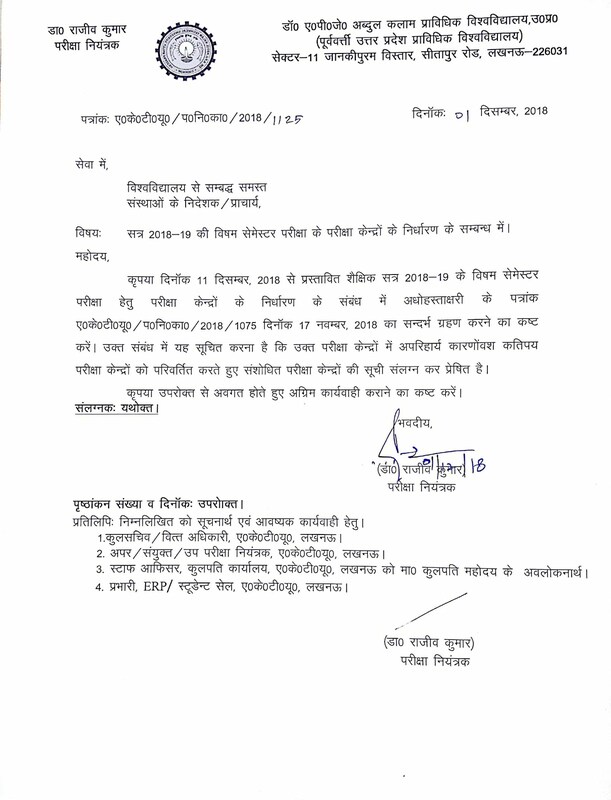 Along with Examination Center List for Odd Semester Examination, AKTU has also released the examination schedule for the UG and PG courses like B.Tech, B.Pharma, MBA, MCA, B.Arch, BFAD, BHMCT, MAM etc. The exam will be held in 2 shifts, morning and evening and timing will be 09:30 AM and 02:00 PM. Eligible students can download odd semester theory exam 2018-19 online admit card from aktu.ac.in, the link will be provided before the exam. The AKTU Admit Cards for odd sem exam is likely to be released 10 days prior to the exam. Students can download AKTU Odd Sem Exam Final Examination Center List for B.Tech B.Pharma MBA MCA B.Arch (1st/2nd/3rd/4th year) from the link given below or you can visit the official AKTU website aktu.ac.in. Students who are currently studying in colleges and have 75% + attendance. Students who are admitted as ex-student. Students having the backlog in any odd-even semester exam. Passout students having the backlog in even+odd semester exam. Course Name:- B.Tech, B.pharma, MBA, MCA, BHMCT, BFAD, B.Arch, M.Tech, M.Pharma, MAM etc.